It is so very unfortunate that African Americans have such a great hurdle to overcome in reclaiming the history of their progenitors. Even though a vital record or a census can help you learn the names of forbears and where they lived, this minimal information is not sufficient enough to tell their story. Delve a little deeper in your search, and you may uncover the sweet finds that help you tell the story of your ancestor’s life. As we researched the descendants of Joseph Blake (b. abt. 1830) from our last post, we could not help but wonder about the story of this farmer who lived through a tough time in American history. A host of his descendants were identified. When you look beyond traditional resources for records that reveal more, you may be amazed at what you will discover about your ancestor’s experiences. After Federal troops were ordered out of South Carolina in 1877 by President Rutherford Hayes, Republicans lost the struggle to maintain order. 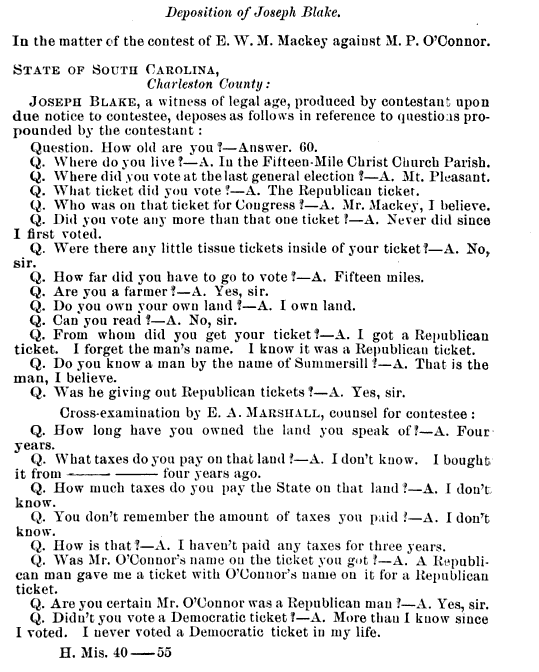 On December 21, 1878 in the Second Congressional Court of South Carolina, Republican to South Carolina House of Representatives, Edmund William McGregor Mackey contested the election day proceedings of 1878 where he claimed that Democrats barred freedmen from voting and forced some to vote for Democrats. 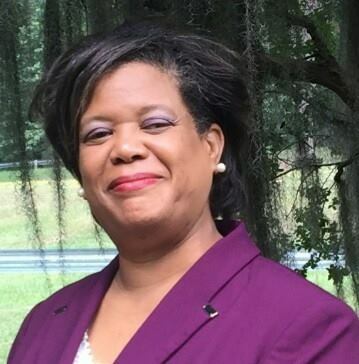 Mackey lost to Michael P. O’Connor, and he accused the Democrats of violence and fraudulent practices such as stuffing ballot boxes to secure a Democrat win. Mount Pleasant, voting precinct of Christ Church Parish in Charleston County, was one place this chaos was believed to have taken place. 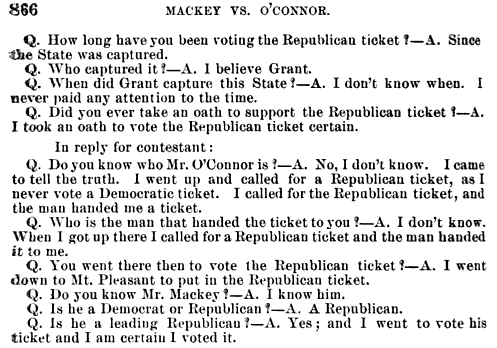 Deposition of Joseph Blake Re 1878 Election. U.S. Government Printing Office 1880 Miscellaneous Documents of the House of Representatives for the Second Session of the Fourty-Six Congress 1879-’80 Volume 5, No. 40, Part I. Digitized on Google Books. If your ancestor does not come up in search results, search for the resource for the area where your ancestor lived. Let us know what you learn about election mayhem and your ancestor on the thread of the Facebook post for this article.